May 15th was a significant day in Nong Khai, Thailand. Not only was it Visakha Bucha Day, celebrating the birth, enlightenment, and death of Lord Buddha, it was also the first day of Bun Bang Fai, or the Rocket Festival. Every year during the sixth lunar month, the rural people of northeastern Thailand, Laos, and Cambodia hold an ancient festival to beg the gods for rain. During this celebration, homemade rockets are fired into the sky. Some people say the rockets pierce the clouds to allow the rain to fall, while others claim that the rockets fired into heaven alert the rain god, who will bless the people on earth with rain and a bountiful rice harvest. Thus, the festival is a fertility celebration. 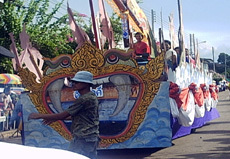 Yet Bun Bang Fai is also a time for sanuk, or having fun. Competitions are often held for the largest rocket, furthest distance, and largest explosion. These rockets, often four to five meters in length, are packed with gunpowder and can travel up to one kilometer before exploding into a huge fireball. In Nong Khai, Bun Bang Fai was held over three days. The first day was designated for the parade, where the rockets were led through the village on colourful floats to the launch site several kilometers out of town, while the second and third days were selected for the lighting of the rockets in rice fields from tall bamboo launch pads. Having participated in the rocket lighting festivities previously in Laos, and remembering fearing for my life as dancing drunken revellers fired rockets indiscriminately along the ground, into crowds of people, and across the river, narrowly missing boat-loads of partiers — hey, all in good fun! — was more than happy to accept my friend's invitation to join her and her family to watch the parade, a less dangerous celebration! As we pulled up in front of her elder sister's home in a village on the outskirts of Nong Khai, I was quickly introduced to her numerous brothers, sister, nephews and nieces who spilled out of the doorway to the patio outside. Her elder sister placed a mug of liquid the colour of ripe banana peels in my hand, and I noticed everyone was drinking the same yellow brew. I asked her what it was and she said, "Sat-oh." I took a long sip. Instantly, I recognized the familiar taste of the sweet rice wine, and took another mouthful. "Arroy mak," I told her and received beams of pleasure all around. After sharing several more mugs of sat-oh and many plates of delicious food we all set off down the soi to Meechai Road, where the parade was just beginning. My friend and I threaded through the crowd and stood at the edge of the road to wait for the procession. People young and old gathered in anticipation. Some waved fans to cool their hot faces, or held umbrellas to shield themselves from the sun's strong glare, while others clumped together under the shade of trees or just braved the heat all together. Impatient children, tired of standing in the hot sun, sat on the pavement holding miniature rockets or scampered back and forth across the road until an adult warned them to stay still as the parade was coming. Soon we heard faint traditional Isaan music growing louder and as we looked down the road we saw two lines of young girls wearing bright pink blouses and yellow flowers in their hair dancing barefoot towards us. They moved elegantly on the hot pavement, turning their bodies in time while their arms twisted gracefully in the air, their thumbs and forefingers touching as their fingers extended back towards their wrists, their dark faces bathed in sweat. Following them was the source of the music, a man perched in the back of a pickup truck, surrounded by children, playing what appeared to be an electric double-ukulele that had what looked like a large flame carved onto the headstock. 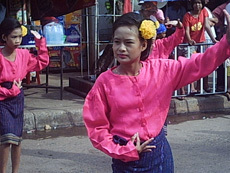 Alongside the truck, several older men and women wearing striped sarongs, oversized shirts, wide hats and sunglasses sang and danced to the music, oblivious to the oppressive heat, passing bottles of whiskey and beer to one another as a young man walked beside them, keeping up the beat with a hand-held drum. Next, the floats slowly rolled past us as the music continued and people danced. A handsome man and beautiful woman dressed in traditional Thai costumes sat astride a life-size replica of a white horse in the back of a pickup, while behind them I met the gaze of the rain god. With a golden face, a wide-open mouth, two huge fang-like teeth and bright red eyes, surrounded by billowy white and blue painted clouds, its was a presence one wouldn't want to mess with. 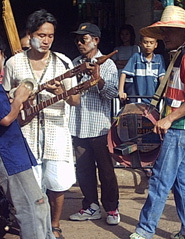 Several more musicians came along playing traditional Isaan music while villagers followed, dancing and singing songs that had many in the crowd chuckling. As the last of the floats rolled past, the crowd began to disperse and we headed back to her sister's house. It was then thunder grumbled low and loud from dark, heavy clouds covering the sun. People turned their heads to the sky, chattering to each other and smiling. A cool wind picked up sharply and my friend grabbed my hand, saying we must run as it was going to rain. As we reached the front door, large droplets began to pelt our shoulders. For several minutes we stood in the doorway watching the rain fall in torrents as people dashed for cover, holding bags and newspaper over their heads and laughing, happy that the heat wave had passed and the rains had come. I think the rain god was happy too.